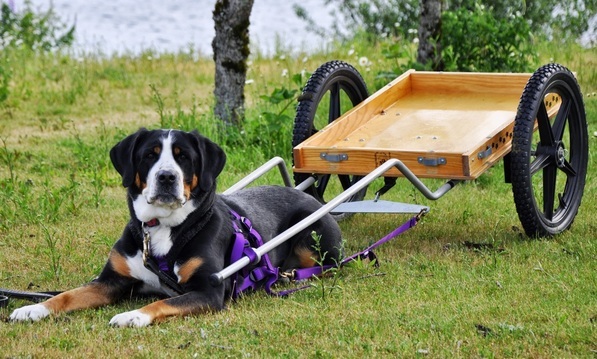 Drafting goes back to the historical roots of the Greater Swiss Mountain Dog breed. Working for a living, the Swissy pulled heavy carts from the dairy farms of Switzerland to market to allow the farmer to sell their goods. Today we celebrate the history of our breed through Draft tests designed to mimic the types of obstacles a working Swissy may have had to negotiate while pulling a cart. Standing calm in harness and working steadily, dog and handler team demonstrate their proficiency to work as a team to negotiate a set course and earn various levels of Draft titles. Obviously the best way of getting into drafting is to learn from someone already experienced with the sport. While the numbers of Swissies drafting is still small, the GSMDCA draft chair might know of a Swissy person in your immediate vicinity who would be willing to introduce you to the sport. Attending a Seminar or Draft Clinic is an invaluable resource for information. Observing and volunteering to help at a draft test is also a great way to learn. Last, don't limit yourself to strictly Swissy events as other local breed and training clubs with rich draft traditions may offer something in your area. Draft Tests are a series of exercises designed to develop and demonstrate the natural abilities of purebred Greater Swiss Mountain Dogs in a working capacity. The Greater Swiss Mountain Dog has historically functioned as a draft dog in various capacities, and performance of these exercises is intended to demonstrate skills resulting from both inherent ability and training which are applicable to realistic work situations. Dogs must be willing to work with their handlers and the exercises must be accomplished efficiently. It is also desirable that the dog evidence willingness and enjoyment of his work in a combination of controlled teamwork with his handler and natural independence. To earn a GSMDCA Draft Dog title, the Swissy must earn a passing score in all elements of the draft test. A NDD title is earned at the Novice (on-leash) level, and a DD title is earned at the Open (off-leash) level.A team title is earned with two dogs attached to the same cart.